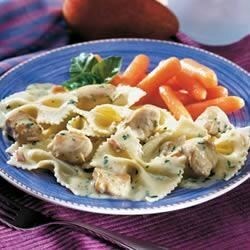 "Use Campbell's® Condensed Cream of Chicken Soup, chicken breast, and bow tie pasta to make an easy one-dish meal with a creamy pesto sauce." Meanwhile, heat butter in skillet. Add chicken and cook until browned, stirring often. Add soup, pesto sauce and milk. Bring to a boil. Cook over low heat 5 minutes or until done. Stir in drained pasta and heat through. I thought this was ok. I was really excited about it bc of the reviews, but thought the soup over powered the pesto flavor and almost left it bland. I added a half cup of parmesan cheese...and I always love more pesto! I only have 2 comments to make....doesn't anyone just make the recipe as stated and then rate it??? Make recipes on sites as it is then add or modify the next time you make it!! Modified slightly, didn't add chicken, made with rotini pasta, also added about 1/4 cup of rocota cheese and 1/8 cup of cream cheese - EXTRA CHEESY-CREAMY PESTO PASTA....very good!